CALAMA, Chile, Sep 11 2015 (IPS) - The inhabitants of the northern Chilean mining region of Antofagasta have the highest per capita income in the country. But some 4,000 local families continue to live in slums – a reflection of one of the most marked situations of inequality in this country. “The contrasts in this region are enormous. The miners earn a lot of money, their wages are really high. It’s common to see enormous houses, and hovels just a few metres away,” said Jaime Meza, who lives in the city of Calama. In the municipality of Calama, where the city is located, there are 37 mining operations. One of them is the Chuquicamata mine, the world’s biggest open-pit copper mine. The region of Antofagasta has the highest GDP per capita the country, the highest level of economic growth, and the best conditions for achieving development, according to a study by the Organisation for Economic Cooperation and Development (OECD). Official figures indicate that this region of 625,000 people has an average per capita income of 37,205 dollars a year, nearly eight times the average per capita income of the southern region of Araucanía, which is just 4,500 dollars. The national average in this country of 17.6 million people is 23,165 dollars. However, 45,000 people are living in poverty in Antofagasta, including 4,000 in extreme poverty. In the region, some 4,000 families, representing thousands of people, live in 42 slums. The city of Calama, known as the “mining capital of Chile”, which calls itself the oasis of the Atacama desert, is located 2,250 metres above sea level, some 240 km from Antofagasta, the regional capital, and 1,380 km north of Santiago. The city is home to 150,000 people, although the floating population of workers attracted by the mines drives the total up to over 200,000. In the municipality of Calama, which covers an area of 15,600 sq km, are located four of the eight mines belonging to the state-run copper company, CODELCO, which has majority ownership of the industry and is the world’s biggest copper producer. A large part of the 57,000 immigrants living in the region, which borders Argentina and Bolivia and is not far from Peru, are in Calama, drawn by the mining industry. The mix of nationalities can be seen on a day-to-day basis, such as in the waiting room at a public hospital. In a short tour of the run-down centre of Calama, which stands in sharp contrast to the better-off parts of the city, visitors run into immigrants from Bolivia, Colombia, Ecuador and Peru. “It’s harder to find a Chilean than a foreigner on these streets,” said Sandra from Colombia, in downtown Calama. The foreign labour force is mainly engaged in domestic service, in the case of women, and in professional and technical jobs or manual labour in mining or construction, in the case of men. A significant number of immigrant women are also involved in prostitution, traditionally a service in high demand in mining towns, where there are many men on their own. 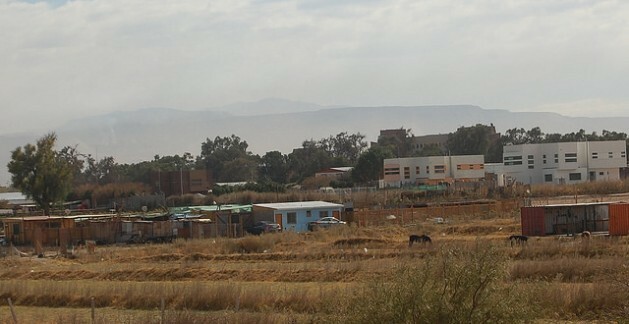 Meanwhile, the profits raked in by the Calama casino grow around 10 percent a year, and the city’s commercial centre receives over 10 million visitors a year. “A miner with little experience can start out earning nearly one million pesos (some 1,500 dollars) a month, and the wages just go up from there,” Jaime Meza told IPS. He works in a company that provides consulting services in social responsibility to mining companies, which leads him to constantly visit the mines. But life in this city is expensive. One kilo of bread, a staple of the Chilean diet, costs over two dollars, and typical housing for a middle-class family costs 150,000 dollars. But “there is money and people willing to pay,” a local shopkeeper told IPS. By contrast, the minimum wage in Chile is just 350 dollars a month, and many immigrants in Calama earn only half that, since they work without any formal job contract or social security coverage. The inequality is put on display when the mining companies pay their workers special bonuses at the end of each collective bargaining session. The bonuses are worth thousands of dollars and local businesses simultaneously launch special sales to draw in customers. “The contrasts in this city are tremendous. The miners line up every Friday to withdraw money and go out carousing, spending it on women and alcohol,” taxi driver Francisco Muñoz told IPS. “The differences are very extreme,” added Muñoz, who was born in Calama and has lived here all his life. The taxi driver said the situation got worse about seven years ago, when CODELCO decided to move the Chuquicamata mining settlement from its spot 15 km from Calama to the city itself. Some 3,200 families were the last to be moved from the installations where the CODELCO workers lived in comfort with all the modern amenities. The miners moved directly to homes built for them, which defined zoning in the city: to the east, the new upscale CODELCO housing, and to the west and the north, the poorer parts of town. “The miners bought these houses at preferential prices, and CODELCO gave them a bonus so they could easily afford them. But now they are selling them at exorbitant prices. 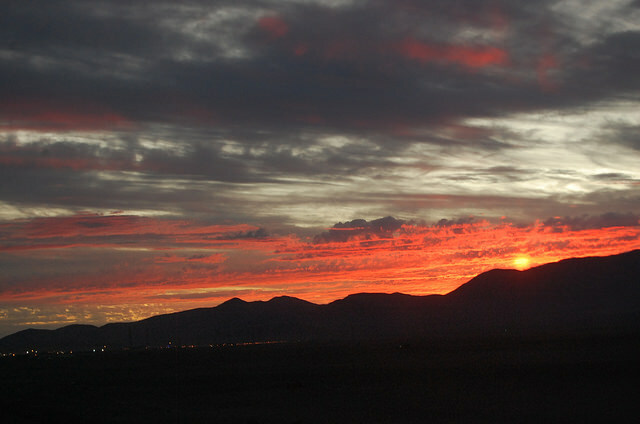 It’s almost inconceivable to think of buying a house in Calama. An ordinary person can only afford (subsidised) state housing, never one of the houses they are selling,” Meza said. The inequality in mineral-rich Calama led in 2009 to a wave of protests demanding that the municipality receive five percent of the revenue brought in by copper, the country’s main source of wealth. In 2014 alone, Chile produced 5.7 million tons of copper – 31.2 percent of global output. The demonstrations, the latest of which took place on Aug. 27, are “a predictable outburst,” in the view of anthropologist Juan Carlos Skewes. “That’s good, because what big outburst do is broaden the avenues of participation,” he told IPS. He added that the protests will undoubtedly continue as long as there is no concrete response to the demands for more equitable distribution of mining profits in Chile – of which Calama sees very little, even though the mines are in its territory.